Welcome to the town of Fort Mill, South Carolina. Fort Mill is situated South of Uptown Charlotte, just a few short miles from the North Carolina/South Carolina state line. Fort Mill is considered one of the best places to live for convenience to Center City, affordable taxes, superior schools, and a friendly atmosphere like no other. Home of the Charlotte Knights and just minutes from Paramount Carowinds, the Fort Mill area offers something for everyone! Upon visiting the Fort Mill area, Baxter Village is an absolute must see! With coffee shops, endless local restaurants, clothing boutiques, a YMCA, and many family events, Baxter is one of Fort Mill’s best places to visit and live. Baxter Village offers many different Real Estate opportunities, including new construction homes, resale homes, townhomes, live work, build on your lot, custom homes, and more. Some of the builders featured in Baxter Village include David Weekley Homes, Pulte Homes, Saussy Burbank, S.E. Miller Homes, and more. 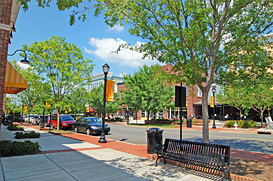 Other popular communities in the Fort Mill area include The Reserve at Gold Hill, Whitley Mills, Stonecrest Villas of Tega Cay, Jones Branch, Mill Creek Falls, Cobblestone, Creek’s Edge, Regal Manor, Baden Village, Reid Pointe, Highland Creek (SC), Lake Ridge, English Trails, Belair at Carolina Lakes, Almond Glen, Rosemont, Audubon Lake, Massey, Chastain Village, Pleasant Glen, Bridgemill, Shelly Woods, and last but not least Sun City by Del Webb. Del Webb’s Sun City is, hands down, the most sought after Active Adult community in Fort Mill/Indian Land area. The community is an absolute tourist attraction, thriving with excitement and endless activities ideal for the retiree that wants to keep an active lifestyle. The community features a golf course, club house, state-of-the art amenity center, computer lab, snack bar, bocce ball courts, tennis courts, a new outdoor pavilion overlooking one of many sparkling lakes, and so much more. Whether you are in search of new construction home, resale home, patio home, townhome, custom home, luxury home, affordable home, attached or single family home, the Fort Mill area offers it all. If you’re in search of a Real Estate agent in the Fort Mill/Indian Land area, please allow one of our experienced team members to assist you in the home buying process. We are passionate about Real Estate and will always go above and beyond to ensure that you are 100% satisfied! We love the Charlotte area and hope you will as well!